STOUGHTON, Mass. – Stoughton’s offense came knocking multiple times throughout the game, but in the biggest situations, Franklin’s defense slammed the door shut. The Black Knights loaded the bases in three separate innings and threatened with the winning run at the plate in the bottom of the seventh, but three separate Panther pitchers came through to limit the damage, helping the Panthers secure a 5-3 win on the road. After two quick strikeouts to start the game from Stoughton starter Zak Paquette, the Panthers cashed in. Senior Alex Haba had an infield single and quickly moved into scoring position by stealing second. Haba came in to score on a two-out RBI from senior Jake Macchi to put the visitors up 1-0 after a half inning. Stoughton loaded the bases in the bottom of the first following a walk to junior George Currier, a single from senior Robbie Seaman, and a catcher’s interference but starting pitcher Liam Dailey induced a ground ball for the third out to keep the Knights off the board. Franklin capitalized on its chances again in the top of the third. Scott Elliott led off with a single and took second when the hit got by the center fielder trying to make a defensive play. Elliott then stole third and came home when the throw from home was high, giving the Panthers a run without a second player putting the ball in play. The Panthers struck again with two outs to increase the advantage. Cooper Ross reached on an error, took second on a single from JB Floris, and game in to score on an RBI base hit from Dan Markowski to make it 3-0. The Black Knights had the leadoff man erased with a double play in the second, and then couldn’t push across any runs when they loaded the bases with one out in the third inning. Currier and Seaman had back-to-back singles and junior James Genest reached on a fielder’s choice to load the bases with the Black Knights trailing 3-0. Again, Dailey was up to the challenge, getting a strikeout for the second out and inducing a pop up behind the plate that was caught on a nice play by Macchi to keep Stoughton off the board. Franklin increased its lead with another big play from Elliott. Junior Jack Nally drew a one-out walk and advanced to second and third on back-to-back wild pitches.Elliot laced a shot to right center field that went past the fielder. With no fence at the Stoughton field, the ball continued rolling allowing Elliott to round the bases for an inside the park home run. Stoughton once again put pressure on the Panthers in the bottom of the fifth, this time pushing some runs across with the bases load. Cian Swierzewski led off with a single, Seaman was hit by a pitch, and Genest single to load the bases with one out. Jacob Kaplan came through with an RBI single to get the Knights on the board, and Michael Nazzaro followed with a base hit of his own to bring another run in, making it 5-2. With the bases still loaded, Brown elected to go to the bullpen and brought in junior Cody Trotin. Trotin came through for Franklin, getting the first batter he faced to strikeout and followed by inducing a fly ball to center to prevent Stoughton from adding to its total. “We’re young and Franklin is a good team,” said Stoughton head coach Mike Armour. “We didn’t do ourselves any favors today. Zak was locked in to start, you saw it with the two strikeouts, and I felt like we could have done him a little better, we could have made some more plays early on. But at the same time, you have to tip your cap to Franklin. They got the bat on the ball and got a few runs across the dish early that ended up being the difference. But we’re still learning, there’s still room for improvement, but all in all, being a hit away from tying this game we’ll take it. Genest took over on the mound in relief for the Black Knights, and after the first batter he faced reached on an error, he retired six straight Panthers. Stoughton brought the winning run to the plate in the bottom of the seventh, but again the Panthers got the necessary outs. Seaman led off with a triple and scored on an RBI single from Genest to make it 5-3. Genest moved to second when Kaplan was walked, putting runners on first and second with no outs, forcing Brown to go to his bullpen again. Junior Will Pacheco got a strikeout and then a fielder’s choice, putting runners on the corners for the Knights with two outs. Pacheco then got a soft line drive back to the mound for the third out, stranding the tying run on first to get the win. Franklin baseball (5-0 Hockomock, 6-0 overall) is back in action on Friday when it hosts one of the top teams in the state in Walpole. Stoughton (3-2, 5-2) is back in action on Tuesday when it travels to Foxboro. 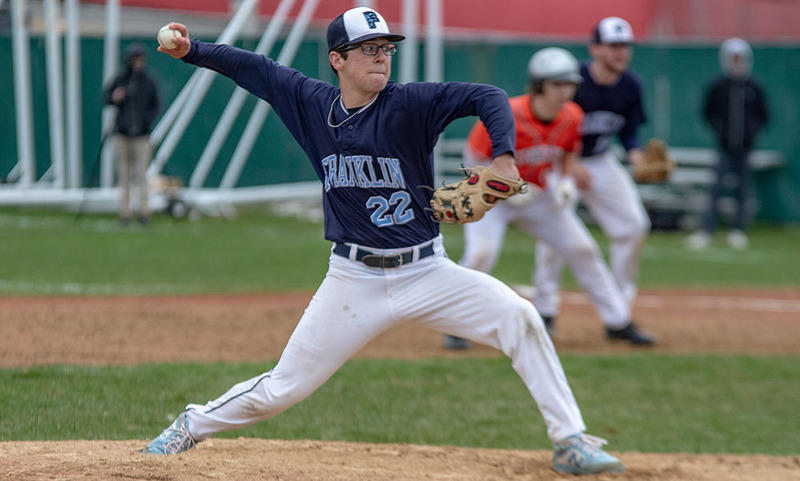 Mansfield, 4 @ Franklin, 5 – Final – Franklin junior Liam Dailey shined in relief, tossing four shutout innings to help the Panthers edge visiting Mansfield. The Hornets scored four runs over the first three innings but Dailey was nearly flawless in his four innings of work, allowing no hits, runs, or walks, striking out one with one hit batter. Mansfield went up 1-0 in the top of the second but Franklin responded with two runs in the bottom half. Dan Markowski knocked in Cooper Ross (2-for-3, run) to tie it, and Brennan Rivera plated JB Floris (2-for-2, RBI, run) to make it 2-1. Dan Saraceno blasted a two-run home run in the top of the third, highlighting a three-run inning for the Hornets. But once again, Franklin had an answer with three runs of its own. Jake Macchi plated two with a double to tie the game, and Floris brought Macchi home with a sacrifice fly for the winning-run.